From the initial enquiry the design engineering team carries the project through circuit development, schematic and PCB layout, mechanical design, to prototype stage and final production. Involvement of the customer is considered to be essential at all stages of product development. We have equipped our in house Product Development Department with the latest technology to allow us to produce designs for equipment utilising, various CAD packages, and development software. 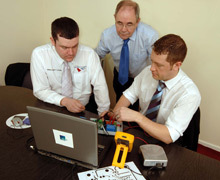 We at GN Systems like to assist people who have ideas but lack the knowledge to develop them further. From concept to reality we can help design a product which may have great market potential. Our Product Development Department is involved in some very exciting and challenging projects. The department is headed by Technical Director, Philip Gordon, who will always be pleased to discuss ideas for new products and designs with both old and new customers. From concept to reality we can help design a product which may have great market potential.